K-Style Advanced Ceramics Co., Ltd, is established in 1995, manufactures wide range of advanced ceramics materials offering ideal solutions for many difficult applications where wear, abrasion, impact, corrosion, and high temperatures cause conventional materials to fail. Standard and custom zirconia powder. Refined ZrO2 is for making cubic. zirconia crystal. Highly pure zirconia is for is mainly used as additive for special optical glass and fibre.3Y2O3-PSZ and MgO-PSZ are principally used for making mechanical component, cutting tools and blades, component of ceramic motor, wire-drawing die and high-temperature structural ceramics. Fully stabilized zirconia (8mol Y2O3-ZrO2) has has sensitive electric property parameter and is used for making oxygen sensors, oxygen detectors, and the fuel cell of third generation and high-temperature heater. 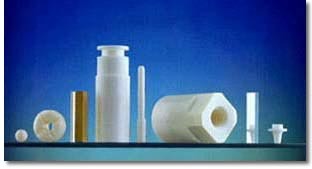 Design and manufacture advanced 3Y-TZP, Mg-PSZ, Al2O3, Si3N4 ceramics for structural applications. Balls are for making ceramic bearings, pumps and valves and forming tools. Rollers are used for super- high-speed parts. Bushing, Cylinder seal Rings, Tubes are used as high-speed sliding-bearings, axle sleeves, mechanical face seals and metal forming tools. Tiles, Plates are used as gauge blocks, blade edges. Bioceramics are for ZrO2 femoral heads and dental implants. Special refractories ZrO2, Al2O3, MgO crucibles for smelting refractory metal, heating element. K-Style manufactures finished custom-made ceramics parts, or blank that you can finish yourself. K-Style’s ability to produce large and complex components is unequaled. we will provide engineering assistance to help you develop cost-effective components that really perform. All you have to do e-mail or fax us your drawing –or sketch, we will contact you by return or send you a quotation. We will send samples for your evaluation. Competitive price and punctual delivery.